While playing Tiny Tower, do you worry about your Bitizens' happiness, or ignore them in favor of staffing your shops? 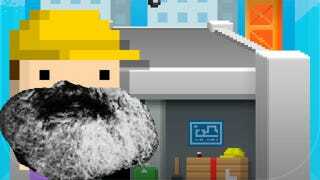 Blogger Jorge Albor at popmatters.com examines the Marxist implications of doing well in Tiny Towers. As Albor explains, playing Tiny Tower works, is not difficult, all it takes is a a little patience, but there's something else that can help you excel—ruthless micro managing and a complete disregard for the humanity of your residents. These Bitizens each have happiness levels that relate directly to their dream jobs for which you can hire them, but making Bitizens happy has little positive effect on your success as the tower manager. As Albor points out in his article, "Tiny Tower is not a game about making people happy. It is a game about management." The full implications of this notion took time to sink in. His journey toward ruthless landlord started small; Albor moved one Bitizen named Ashley from her dream job in a photo shop to an un-staffed mini-golf course which would boost the low entertainment value of the tower. Neither Ashley, nor the photo shop, which had other employees keeping it open, were any worse off. Sometimes the needs of the many outweigh the needs of the few. Jorge was pleased with his success, and moved on to evicting handfuls of Bitizens to make way for residents who would open a brand new bakery. Albor points out that the Marxist flavor of Tiny Tower's economy may be a reflection of the good versus bad choices in other games. In some cases, good or bad is literally as easy as Jedi or Sith; in others, there are shades of gray. How easy is it for your Fable 3 hero to waffle between benevolent mayor and gluttonous sycophant? That leads Albor to step back and talk about how some of that morality finds its way into the develop of a game as well. For instance, Tiny Tower uses Bitbook, the fictional bitizen version of Facebook to prod gamers into playing more. "[Bitbook] exploits the pixelated characters' charm to constantly remind (or guilt) the player to re-stock floors with statements like: 'Closing up the barber shop, hope I don't lost my job!'" Is there a difference between what motivates you as a video game character, and what motivates you in real life, I wonder? Personally, when given the choice in a game, I will always chose the path of darkness. I find it's more fun to run around blowing things up and kicking animals that don't deserve it. Pushing around bitizens for personal gain doesn't bother me much, though if I met these people in real life I would feel pretty terrible forcing them to give up their life dream for the sake of the economy. Why is there a disconnect between the way you live your real life and the way you lead a digital one? And more than that, should we be rewarded for leading self-important video game lives? Tiny Towers doesn't seem to reward altruism, allowing gameplay to go uninterrupted even if every single bitizen is dissatisfied. I've been playing for a couple days already, made no effort to make my residents happy, and yet people keep signing up to move in and my tower continues to reach the sky. Perhaps it's my bad-guy video game persona, but the happiness of the bitizens doesn't really concern me if it's not going to help my own high score. Marx would be proud.